Our Boat Assisted Kayak Eco Tour combines the best of a boating tour, a kayaking tour and a walking tour all into a single, wonderful experience! Boating Eco Tour. Your experience begins with a naturalist led boat tour into the 10,000 Islands Wildlife Refuge that surrounds Marco Island. It is one the most beautiful natural areas in Florida and one the few get to experience. Every day is different, but, you can expect to encounter a wide variety of wildlife depending on the day's conditions - manatees, dolphins, sea turtles, bald eagles, ospreys, herons, egrets, roseate spoonbills and many different species of shore birds. Your Florida Master Naturalist guide and US Coast Guard Captain will introduce you to the area's unique ecosystems, its history and its culture. Your final destination will be a remote, uninhabited island like Shell Key, Kice Island, Panther Key, Morgan Key or, may be, where the Gulf of Mexico waters are claiming the Dome Houses of Cape Romano. Kayaking Eco Tour. 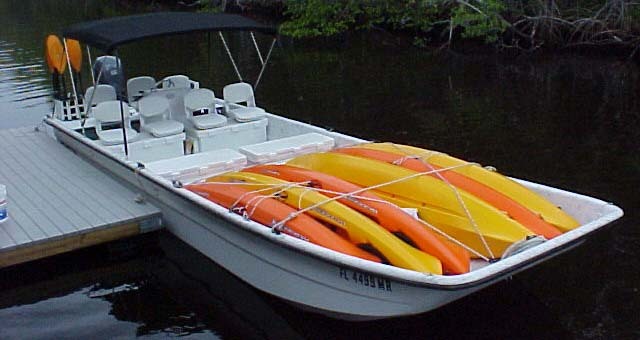 With six kayaks aboard, your guide will safely bring you to a remote part of the 10,000 Islands. Once we reach our destination, very stable, comfortable kayaks are deployed in calm waters for a leisurely paddle. Kayaks are quiet and work very well in our shallow waters allowing you to get close to the flora and fauna ... closer than you can in a boat or any other means. We do not paddle far or fast. This is a leisurely tour experience ... the kayaks are for access, not exercise! With a bit of instruction from your guide, you will be comfortably on your way in no time. Previous kayaking experience is not required. One and two-person kayaks are on every tour so you can paddle with your friend, partner or child. 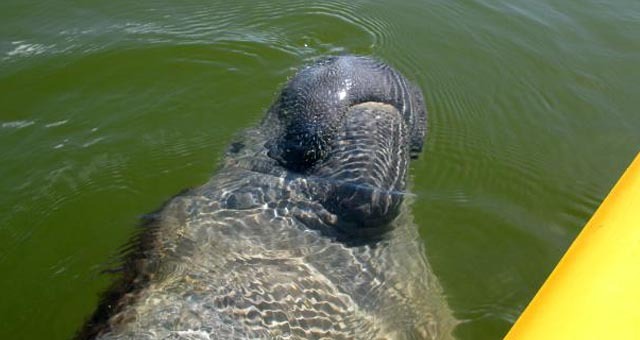 Imagine paddling next to a manatee or a dolphin!!! Walking Eco Tour. Conditions usually allow us to paddle to an uninhabited barrier island. There your guide will lead you on an interpretive, leisurely stroll. There is a lot to see and a lot to experience these remote island beaches ... wrack lines, shallow intertidal zones, dunes, uniquely adapted plants, mangrove swamps and many different invertebrate species. This is a hands-on experience on a remote barrier island beach that is seldom visited by others, so the shelling on these islands can be awesome ... happy shelling! After the island walking tour, we will paddle back to the boat for the ride back to our dock. Don't worry. We will be back in time for a seafood dinner at a local restaurant. Don't forget your camera! of our tours, and learn about upcoming special events and offers. Follow us on Twitter to get live updates during our tours. © Copyright MarcoIsland-BoatTours.com a division of Everglades Area Tours (EAT). All Rights Reserved.